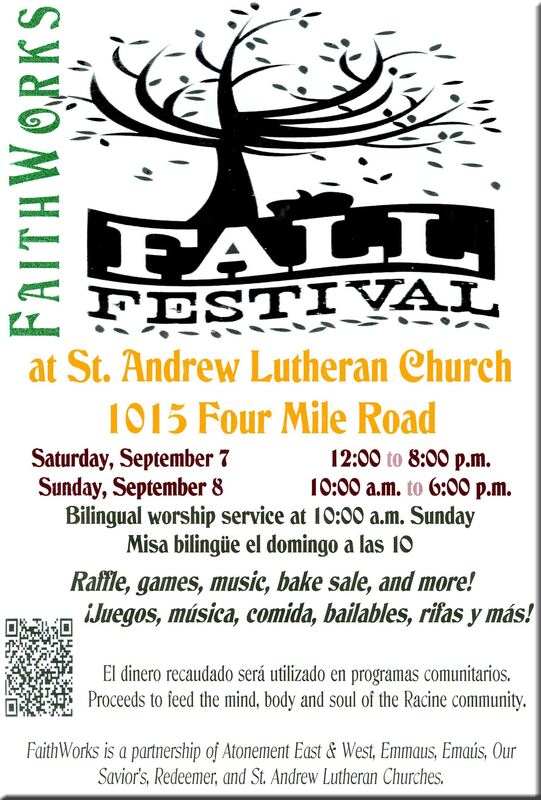 The FaithWorks Fall Festival to be held at St. Andrew Lutheran Church, 1015 Four Mile Road, north of Racine. Festival hours are from noon to 8:00 p.m. on Saturday, September 7, and 10:00 a.m. to 6:00 p.m. Sunday, September 8. Come for food, fun and entertainment for all ages! Food, fun, and a variety of entertainment for young and old will be offered during the two-day festival. In addition to grilled hot dogs, brats and hamburgers from Danny’s Meats, Mi Jacalito restaurant will offer an authentic Mexican menu; there will also be nachos from the Blue Sombrero. Sweets and desserts will be sold at the all-church bake sale. The five congregations of FaithWorks will come together in worship Sunday, September 8 at a special bilingual 10:00 a.m. service at the festival. Bouncy houses, face painting, balloon art and games will be offered for the kids. Bingo will be available for the adults. Various musical groups will perform on two stages both days of the festival. Cash prizes ranging from $50 to $1,000, as well as several other items from church members and corporate sponsors, will be raffled off. The Care Abounds in Community program of Thrivent Financial for Lutherans has also announced that the FaithWorks Fall Festival has been approved to receive matching funds for the two-day event. A host of volunteers, including a number of Thrivent members from the five sponsoring congregations, will be involved in the sale of tickets, planning, set-up, and activities throughout the weekend of September 7 and 8. Thrivent will match festival proceeds at a one-for-three level, up to a maximum of $1,600. Earnings will then be divided among the ELCA Latino ministry in Racine and FaithWorks, to be used for community outreach ministries, including helping educate children and feeding the hungry of Racine. The festival is sponsored by the FaithWorks ELCA congregations of Racine: Emmaus/ Emaús, Atonement East and West, Redeemer, Our Savior’s and St. Andrew. I have some information Liliana….maybe you can have an answer before tomorrows meeting…•	Hey Brenda, – I saw your request online for tents donated and baskets. We are doing something similar and we have also done stuff like this for other organizations. You might call General Rental and ask them how to ask to use the WE Energies tent and the Johnson Bank tent. I know you can put in a request… not sure if it is too late or not. Also, if you put together a letter with the churches 501C3 and drop it off at Chick Fil A – they will normally do a basket. You might also try contacting the Racine Raiders and ask if they would help. Just a couple of ideas. Hope it helps.